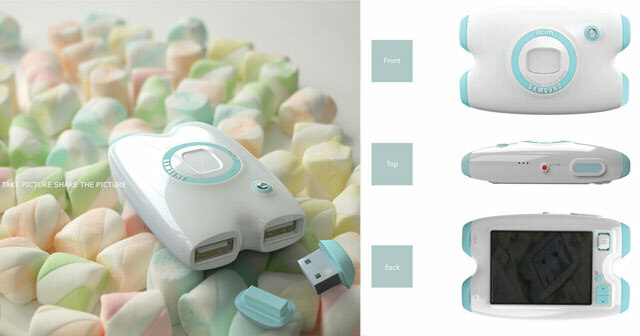 It resembles either a Fisher-Price View-Master toy or a cutesy USB hub, but looks can be deceiving. Instead, it’s a unique concept for a tech-savvy digital camera. While not officially in production, much less on the market, the Samsung UCIM camera design opens the door for an entirely new way to approach USB technology. Featured in the popular web magazine, Yanko Design, designer Jung Eun Park came up with the idea for the Samsung UCIM camera. Aside from its sweet and colorful appearance, the camera is equipped to hold three flash drives at once. The UCIM allows you to bypass the numerous inconvenient steps it takes to share your pictures with family and friends. As you know with digital cameras, you have to remove the memory card from your camera and connect it to a computer after you take pictures. From there, you have to deal with waiting for the pictures to load to a file folder. To share those pictures, you must take additional steps to send them in an email attachment, load them to a USB stick or burn them to a disc. With Park’s concept, you don’t need a nearby computer. Access to pictures is instant; you insert up to three USB memory sticks into the device. Next, it’s as simple as taking the pictures or video and removing the flash drive when you are finished. The pictures and video are immediately loaded onto the three USB drives simultaneously. The Samsung UCIM USB camera seems like a great idea for social situations where you’re with a big group and multiple people ask, “Oh, can I get a copy of that picture?” With this kind of camera, it won’t be a hassle to fulfill that promise. You may be thinking that you can do the same thing by loading smartphone pictures to Facebook or Twitter. However, a camera like this would allow you to instantly go to your nearest drugstore photo kiosk for high resolution prints. The UCIM just provides so much simplicity and as much as we love technology, it can save users a lot of time by making the concept of digital sharing speedy. Are you loving the Samsung UCIM? What do you think of the use of three USB ports? Share your thoughts! This entry was posted in Articles, Flash Drive, Samsung, USB Flash Drives, USB Future, USB Hub, USB Technology and tagged Digital Cameras, Samsung UCIM, Samsung UCIM camera, Samsung UCIM USB Flash Drive Camera, UCIM, USB camera, USB memory sticks, USB ports, USB technology. Bookmark the permalink.